"You may have access to paragraphs 1 to 3 including footnotes 1 to 7". The EU Council replied to WSRW's request for public access to its legal opinion on including Western Sahara in the new EU-Morocco fisheries agreement. On 22 November 2018, Western Sahara Resource Watch (WSRW) issued a request for access to the EU Council's legal opinion on the new proposed EU-Morocco Fisheries Agreement and its Protocol, that will explicitly be applied to occupied Western Sahara. The EU's controversial fishing practice in Western Sahara originates from an old Spanish-Moroccan agreement that was signed during the Franco-era. 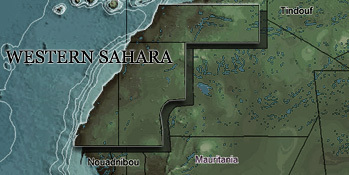 Shortly after, as the Spaniards withdrew from their colony, Morocco went on to occupy large parts of Western Sahara, to UN condemnation. The EU Council's lawyers have lost four consecutive court cases against the representatives of the Western Sahara people in the Court of Justice of the European Union. Each time, because they had failed to take into account that no deals in Western Sahara can be struck without respecting the Saharawi's right to self-determination. However, the CJEU's decisions have systematically been ignored by the EU institutions. All evidence suggest that the EU has forgotten to address this issue yet again, as the new deal is up for vote in the European Parliament in February. The UN-recognised representation of the people of Western Sahara, the Polisario Front, has already initiated legal proceedings against the proposed fisheries agreement. In view thereof, WSRW made a request for access to the Council's legal opinion on the proposed fisheries agreement, under EU legislation granting EU citizens access to documents of the EU Parliament, Commission, or - indeed - Council. The Council Secretariat responded on 19 December 2018 by sending the first two pages of the legal opinion - the following 14 pages had been deleted. Find the legal opinion, as the Council chooses to share it with the EU public, here. The document as sent to WSRW, contains literally only three introductory paragraphs. The accompanying letter, arguing why the legal opinion can't be fully disclosed, is much longer. The argumentation is quasi identical to the explanation for denying WSRW full access to the legal opinion on extending the EU-Morocco trade deal to occupied Western Sahara. Here are the main arguments, and our rebuttal. "the Agreement and Protocol have not yet been definitively concluded. Since the contribution deals with delicate issues, disclosure of the legal advice could negatively affect the completion of the ongoing procedure for the conclusion of the Agreement". This seemingly suggests that divulging the opinion would undermine Council's preferred outcome: that Parliament supports the proposal. In two weeks from now, all Members of the European Parliament will cast their vote in plenary on the proposed agreement. That Council refuses to share its legal opinion, raises questions as on the solidity of the analysis. "the legal advice pertains to matters that are sensitive in the context of international relations and the disclosure of the requested document could also have a negative bearing in the relations of the Union and its Member States with the Kingdom of Morocco." WSRW maintains that the important relations with Morocco are best served by acting in accordance with international and EU law. Morocco deserves clarity from the EU. Procrastinating and postponing the inevitable - yet another Court Ruling differentiating between Morocco and Western Sahara - has a much more negative impact on the EU's relation with Morocco, than ripping off the geo-political band-aid in one go now. The letter also refers to the action for annulment brought by the Polisario Front on 14 June 2018, against the Council's decision to authorize the EU Commission to open negotiations for the fisheries agreement and protocol with Morocco (Case T-376/18). Disclosure would "therefore undermine the protection of court proceedings", the Secretariat writes. "Moreover, disclosure of the legal advice could also affect the ability of the Legal Service to effectively defend decisions taken by the Council before the Union courts." Again, if the legal advice is solidly grounded in law, there should be no difficulty defending it before the Court - regardless of whether it had been made public or not. "Lastly, the Legal Service could come under external pressure which could affect the way in which legal advice is drafted and hence prejudice the possibility of the Legal Service to express its views free from external influences." This is a most disturbing thought in a rule-of-law system which values judicial independence, such as the EU. It is the task of a legal service to verify compliance of proposals with the law, and on that basis provide advice as to whether the proposal is acceptable or not. Transparency does not imperil free expression of lawyers - governmental secrecy and back-door influence might be the much bigger threat. It is interesting that the legal advice appears to cover not only the proposed Fisheries Agreement, but is drafted as a one-size-fits-all framework to cover any possible future agreement between the EU and Morocco that is intended to apply to occupied Western Sahara: "the legal advice provided in the requested contribution goes beyond the present file and has a more horizontal dimension, as it could be transposed each time an agreement between the same parties is envisaged. The legal advice is therefore sensitive", the Secretariat writes. The EU Council and Morocco have signed the new SFPA on 14 January 2018 in Brussels. All EU Member States, with the exception of Sweden, support the agreement. Its formal conclusion will have to await the vote in the plenary session of the European Parliament on 13 February 2018.